The sample standard deviation (s), standard error of sampling distribution, population size N & Z-score for the confidence levels are the input parameters of this calculator. This calculator also featured to generate the complete work for step by step calculation for any given set of corresponding input values to learn how to estimate confidence limits for 91%, 92%, 93%, 94%, 95%, 96%, 97%, 98% & 99% of confidence levels or solve the similar confidential interval worksheet problems by just changing the input values of this calculator. What is Confidence Interval & its Usage? 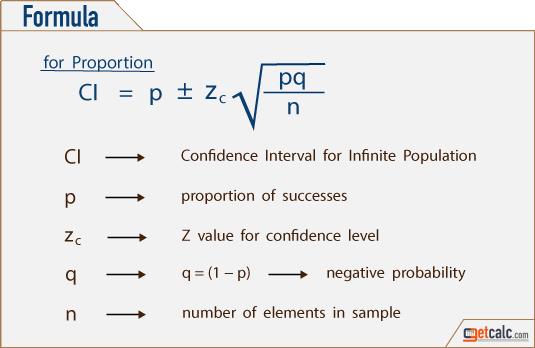 Confidence Interval is measure or estimate of confidence limits from the mean or from the proportion of finite (known) or infinite (unknown) population, by using standard deviation or p value. In probability & statistics, generally, it is a range of values within which a unknown value of population parameter lie or expected to lie between the intervals in the statistical surveys or experiments. For infinite or unknown population, it's an estimation which represents the range of values within which the population parameter lies based on the sample statistic point estimate of population mean (X̄), standard error of sample mean and the Z-score for confidence level. For finite or known population, it's a measure of confidence interval which represents the range between two values within which the population parameter lies based on the population mean (μ), standard error of sample mean and the Z-score for the confidence level. Instead of population parameters, the sample statistic is used in the estimation of standard error. Therefore, the large values of sample makes the sampling distribution approximately normal. The Z-score in the calculation is a measure of the degree of reliability of the interval. Users may refer the below table to choose the corresponding Z-score for the different confidence levels. The confidence interval is a widely used method to estimate the degree of confidence in statistical experiments. The wider confidential interval increases the confidence of unknown population parameter lie between the limits and vice versa. Users may find the confidence interval or generate the work with steps for different confidence levels 91%, 92%, 93%, 94%, 95%, 96%, 97%, 98% & 99%. 4. confidence interval estimate for proportions of known population. Users can generate the confidential interval work with steps for any corresponding input values by using this calculator. This may helpful for grade school students to solve the confidential interval worksheet problems by just changing the input values. The below are some of the solved example problems which are generated by this confidential interval calculator. The example calculations include finding confidential interval for finite or infinite population by using either standard deviation or p value of the population.